Soak it for 4 hrs in water.Strain it. Roast it slightly brownish till it crackles in low flame. After it cools down,sieve it and the skin will come out. In a heavy bottomed pan,dissolve jaggery with 1 tsp water. It should become a thick string. When we put one drop in water,we should be able to make a ball.This is the right consistency. Then switch off the gas. Mix it with sesame seeds.Use long thin spoon while mixing. Apply ghee in your palm and make small balls.Don't press too much while making balls. Hi Rajeswari!,this is one of my Hubby's fav and this can be tried at home easily. 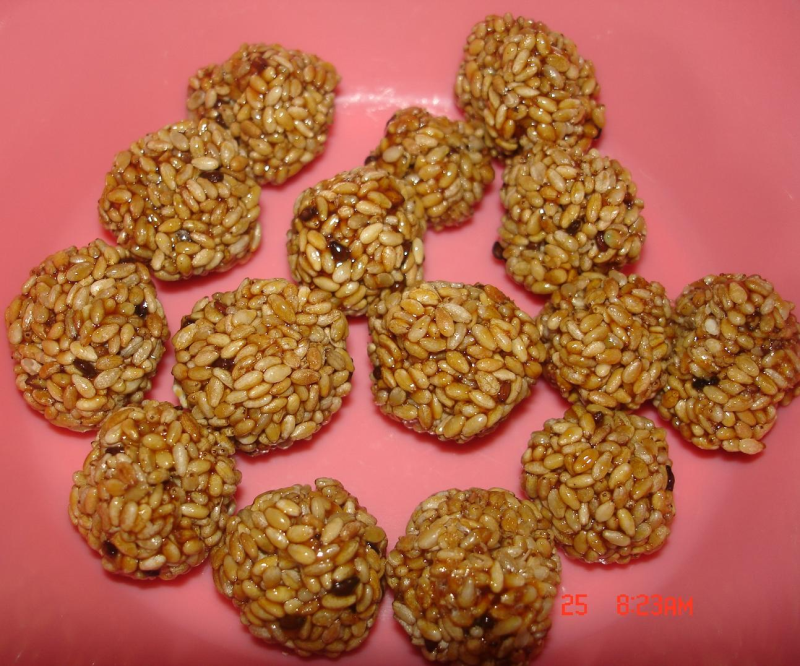 (we do this using black sesame seeds- as 'ladoos' or as square shaped 'Ellu Mittai').